February 1, 2011 marked the 50th anniversary of the release of “The Misfits,” the iconic and underrated film about Nevada mustangers who brutally capture wild horses so they can sell them to the slaughterhouse. Deanne Stillman reports. Although panned by critics, the film is a powerful and enduring deconstruction of the western, although perhaps more play-like than cinematic in its formulation. Directed by John Huston and written by Arthur Miller, it starred Marilyn Monroe, Clark Gable, Eli Wallach and Montgomery Clift, with Thelma Ritter in a supporting role. To commemorate the film’s release, a special screening of it was held on February 13 at the University of Nevada at Reno, in conjunction with the university’s “Honoring the Horse” exhibit. “The Misfits” alerted many people to the then little-known war against wild horses playing out in Nevada, and, in my opinion, contributed to the early demise of three of its four stars – Gable, Clift and Monroe – all of whom died after the film was wrapped; in Gable’s case, 12 days later. Clark Gable as Gay Langland in The Misfits. © Metro-Goldwyn-Mayer Studios Inc.
Men like these had been coming to Nevada for a long time, barely managing to wrest a living from the extreme terrain. They were miners, drifters, day laborers, hardscrabble ranchers; at the end of the 19th century, when the frontier closed and old ways of making a living dried up, they turned to mustangs, whose day was over in the eyes of those who saw them simply as a form of transportation or carrier into battle. Vast herds were running the Nevada range and elsewhere across the West. They were descendants of mustangs that had returned to the land of their ancestral origin, linked by DNA, as we now know, to Ice Age horses that had evolved on this continent. They came with conquistadors, lived in the region for generations, mixing with horses that had escaped from or been dumped by ranchers, settlers, the Army, forming their own bands, finally left alone, until one day someone started running them out of the mountains to the slaughterhouse, where they were processed and shipped to dinner tables in France. Clark Gable and Marilyn Monroe in The Misfits (1961). © Metro-Goldwyn-Mayer Studios Inc.
Montgomery Clift © Metro-Goldwyn-Mayer Studios Inc. It was men of this sort whom Arthur Miller met while living in Nevada and whose lives he wrote about in his Esquire short story, which he then adapted as a screenplay (the short story is excerpted at length in my book Mustang). 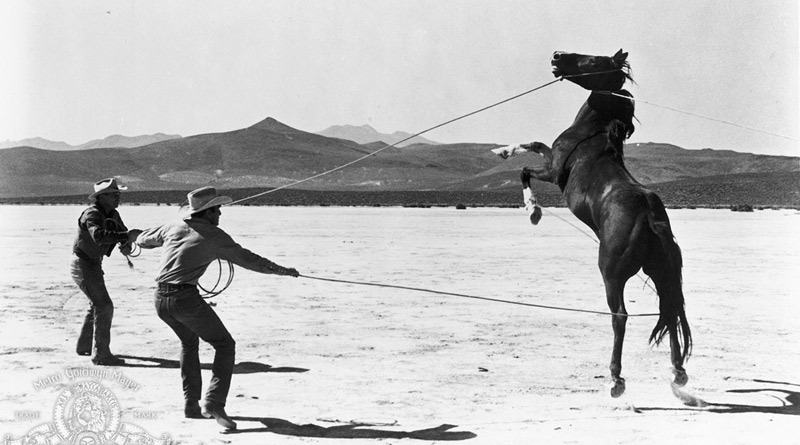 The film version of “The Misfits” features the three main characters from the story – Gay Langland (Gable), Perce Ritter (Clift) and Guido Racanelli (Wallach), the men who plan to make a quick score by hunting down a band of wild horses. For the adaptation, Miller added a fourth character, a woman named Roslyn Taber. This part was a gift from Miller to his beloved Marilyn, whose well-known personal turmoil was interfering with her movie career, with some studios unwilling to cast her in further roles. The three men – Gay, the last of a dying breed of cowboy, Perce, a down-and-out bronco rider, and Guido, a pilot for hire – have met in a bar and formed a friendship born of immediate need, desperation and a lifetime of defying the conventional world. “I don’t want nothin’,” Perce says in the original short story, “and I don’t want to want nothin’.” “That’s the way, boy,” Gay tells him. Into their world walks Monroe’s Roslyn Taber, who has come to Reno for a divorce; she seeks truth and authenticity, and is appalled by the every-day brutality of life. Gay and Perce fall for her, and when she tends to Perce’s injuries after he falls from a bucking bronco, he asks her if she belongs to Gay. “I don’t know where I belong,” she says. Yet an entanglement with Gay has begun. Finding out that Gay and his friends are planning to round up mustangs and sell them to a rendering plant, she is horrified and heads to the trap site with Perce as Gay has just lassoed a mustang that has been harried onto the flats by Guido in his plane. Its lungs are screaming and heaving in the desert heat and its coat is slick with sweat. Gay is locked in a fierce battle with the horse, and Roslyn runs from the truck and jumps him, trying to stop the capture. With the horse bucking frantically, Gay throws Roslyn to the ground, tightening the noose as the stallion drags him until the mustang finally buckles and falls to the ground with the exhausted cowboy collapsing on his body. Recovering, Gay cuts the horse loose. The animal gallops away and joins the others, also set free by the cowboy to the dismay of his compadres. She and Gay head home too. “I gotta find another way to be alive,” he tells her, aiming his pickup for a star in the sky. Usually, a Marilyn Monroe movie was a huge success. But this one was dismissed by critics. And, strangely, most of the stars of the movie did not live long past the film’s completion. It wrapped on November 4, 1960. The next day, Clark Gable had a heart attack. He died 11 days later. For the next two years, Marilyn Monroe degenerated, finally dying of a drug overdose – although the question of whether this was a murder, accidental overdose or suicide will forever be debated. In 1966, years of drugs and drinking finally caught up with Montgomery Clift and he too died of a heart attack, at the age of 45 – one night when The Misfits was on television. Marilyn Monroe and Arthur Miller on the set. © Metro-Goldwyn-Mayer Studios Inc. Barrels of ink have been spilled in analyzing the problems that plagued the filming of The Misfits and perhaps led to a less-than-perfect movie. When it comes to the demise of its stars after the film wrapped, some blame Gable for jeopardizing his own health – “he shouldn’t have done his own stunts,” “he was too old”; and then there are those who blame the desert – everyone was “breathing too much dust.” When it was all over, Arthur Miller and Marilyn had split up; the script the playwright had written as a gift to his wife was not that at all and their marriage faltered and collapsed. The sun shone hot on the beige plain all day. Neither fly nor bug nor snake ventured out on the waste to molest the four horses tethered there, or the colt. … Toward evening the wind came up, and they backed into it and faced the mountains from which they had come. From time to time the stallion caught the smell of the pastures up there, and he started to walk toward the vaulted fields in which he had grazed; but the tire [to which he was tied] bent his neck around. … The cold of night raised the colt onto its legs, and it stood next to the mare for warmth and the other horses closed their eyes and slept. The colt settled again on the hard ground and lay under the mare. … When the first pink glow of another morning lit the sky the colt stood up, and as it had always done at dawn it walked waywardly for water. The mare shifted and her bone hoofs ticked the clay. The colt turned its head and returned to her and stood at her side with vacant eye, its nostrils sniffing the warming air. Later that day, the men would come back, and take the horses to the slaughterhouse. In the weeks after The Misfits wrapped, Marilyn would sit for hours in a disguise and watch the horse carousel at the Santa Monica pier. We do not know what was on her mind and in her heart as the gaily painted animals turned forever. A fragile soul on and off the screen, she may have given great thought to what was really going on in Nevada, and to the fact that her lover, Arthur Miller, had torqued the truth to resurrect her career and, because she was in love with him, she had played along. “I don’t know where I belong,” she tells Perce in the movie – and perhaps she found a moment at the carousel. The place where The Misfits was filmed is now a tourist attraction, and it’s called Misfits Flat. Wild horses still come down from the mountains and head across the flats, running for their lives as never before, now surrounded on all sides by freeways, belonging, like Marilyn, to the ages. This article first appeared on www.truthdig.com. Deanne Stillman’s latest book is the widely acclaimed Mustang: The Saga of the Wild Horse in the American West a Los Angeles Times “Best Book ’08” and winner of the California Book Award silver medal for nonfiction. Her book includes an account of the 1998 Christmas horse massacre outside Reno, Nev., as well as the story of Bugz, the lone survivor of the incident. Her previous book was Twentynine Palms: A True Story of Murder, Marines, and the Mojave, the cult classic which Hunter Thompson called “A strange and brilliant story by an important American writer. It’s now out in a new, updated edition. Her work appears in the Los Angeles Times, Slate, Orion, National Review Online and other publications and is widely anthologized. Her plays, including “Star Maps,” have won prizes in theater festivals around the country. Her book Desert Reckoning: A Town Sheriff, a Mojave Hermit, and the Biggest Manhunt in Modern California History is based on her Rolling Stone piece Mojave Manhunt.